Shareholders of PetroAmerica (PTA.v) might have some PTSD these days. It was just a few months ago that the stock jumped to 44c from 35c on heavy volumes, in what the always reliable CEO.ca called a “confirmed breakout.” Except it wasn’t so much a breakout as a pump. A stock with average volumes around 1.5mln shares/day instead had 20 million shares of volume in 2 days. Woo hoo. Then the confirmed breakout turned into confirmed wealth destruction. 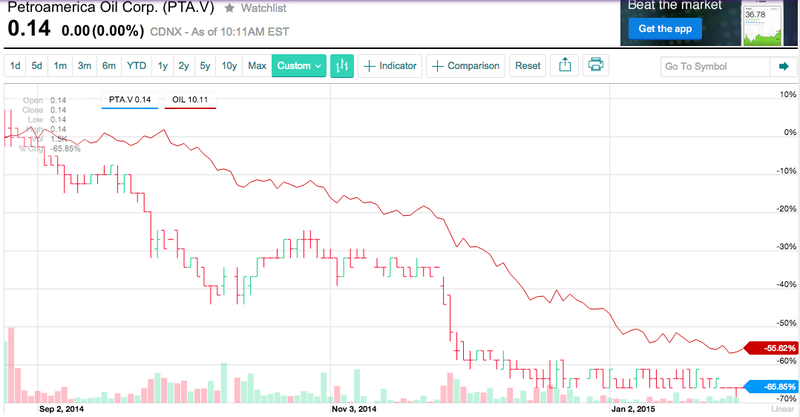 By October 9, with the OIL ETF down less than 10%, PTA.v had fallen more than 40%. I guess it’s just nice that PTA.v has held its 14c level so well the last few weeks, letting oil catch up with its drop. One might be tempted to wonder if the state of his portfolio has anything to do with Giustra’s decision to immolate suspend print publication of Modern Farmer? This entry was posted in Uncategorized on January 30, 2015 by Steven Bodzin. Want to understand Colombia’s gold mining situation? You need to read the newish Atavist book, The Devil Underground, by Nadja Drost. Here, Drost has written the best explanation I’ve ever seen of the battle for Antioquia between the Urabeños and the Rastrojos. And has shown herself to be a brave, serious reporter who will stop at nothing to really understand a story. And has given readers an idea of what they buy when they buy gold, particularly Colombian gold. She has also written one of the most beautiful pieces of literary nonfiction I’ve read in a long time. I’ve been reading and writing a lot about Gran Colombia Gold, which is trying to turn Segovia into a normal professional mine. I have been reading about this situation for years, but now I feel like I am about 10 times closer to understanding it — even though this book barely mentions Gran Colombia. It’s well worth your US$3.99. Go read it. UPDATE: I hadn’t seen this, which shows that a connection between crime and gold may remain present in Colombia. This entry was posted in Uncategorized and tagged $GCM.to, colombia, crime, gold on January 22, 2015 by Steven Bodzin. Did Pratt & Whitney do all it could to avoid a corrupt deal? A document leaked to the web in November raises questions about whether multinational companies did all they could — and all they were legally required to do — to avoid participating in potential corruption in Venezuela’s electricity industry. The document in question is a chain of e-mails between Pratt & Whitney Power Systems and ProEnergy Services. It, along with the others in that same collection of ostensible leaks, appears to show that some of the turbines eventually sold to Venezuela came from Pratt & Whitney Power Systems. At the time, that company was a unit of publicly traded United Technology Corp. (UTX), but has since been sold to Mitsubishi Heavy Industries Ltd. (7011.jp OTC:MHVYF ) and renamed PW Power Systems. The simple fact is that parties should know with whom they are doing business. Companies and individuals should take necessary precautions to ensure that they have formed a business relationship with reputable and qualified third parties. The extent of diligence that should be conducted on a particular third party is a fact-based inquiry that will vary depending on a number of factors, including the industry, the market, the type of transaction, and the historical relationship with the third party. This entry was posted in Uncategorized and tagged corruption, fcpa, mitsubishi, pratt & whitney power systems, pwps, united technologies, usa, venezuela on January 12, 2015 by Steven Bodzin. Since people seem so interested in the Rincón family these days, here’s another snippet for you. 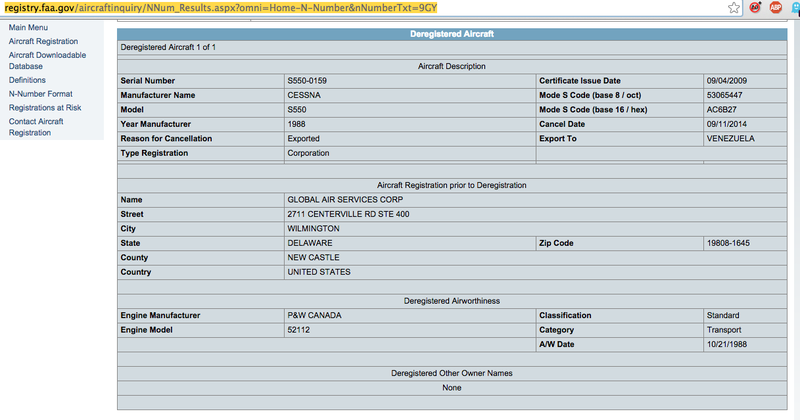 A reader points out that the Cessna Citation with US registration N9GY, which I wrote about a few weeks ago, has been delisted in the USA and exported to Venezuela. This entry was posted in Uncategorized and tagged planes, usa, venezuela on January 10, 2015 by Steven Bodzin. Yeah, Otto, it’s a coincidence. 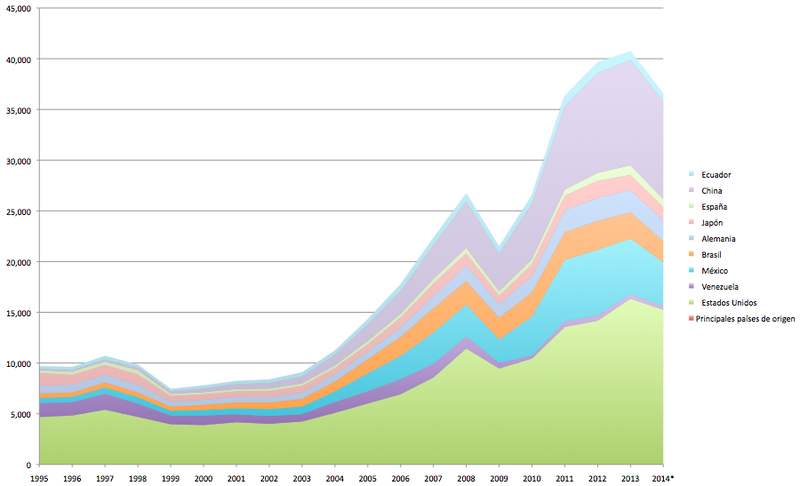 Colombia is importing more from lots of countries, not just the USA. All figures from here. 2014 numbers are just through October, so that decrease is likely to disappear in final figures. As you can see, the big winners since 2010 have been Mexico (free trade agreement since 1995) and China (no free trade agreement), much more than the USA. Commodity price trends and changes in Colombian access to consumer credit (for Chinese knickknacks) are probably bigger factors in this chart than trade agreements. This entry was posted in Uncategorized and tagged china, colombia, mexico, trade, usa on January 7, 2015 by Steven Bodzin.